Is it him you're looking for? 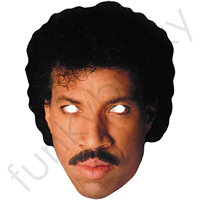 A Lionel Richie 1980's Mask, great for parties. Coooool! Lionel went down fantastically on my 80s night! great item, great allround service, many thanks.!!!!!!!!!!!! FAST dispatch, very much appreciated. These are great!